The aim of the game is to guide Rob-O-Tronic to the exit on each level. Once you’ve made a move in a certain direction you will continue in that direction until you hit an obstacle. You have to plan your route and use the walls and obstacles to send Rob-O-Tronic down the correct path. Making a wrong move can send you down a dead-end. 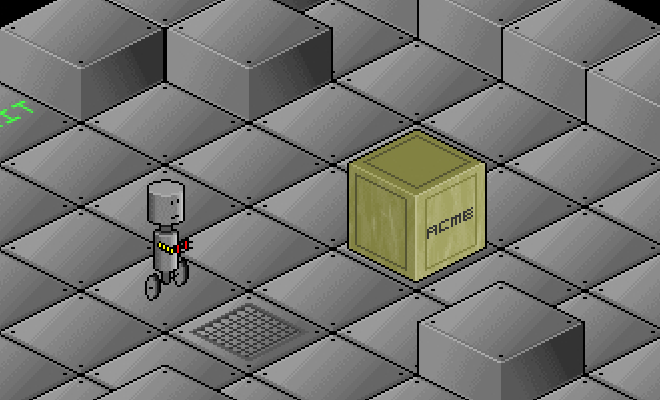 The game was developed to explore the graphical and programmatic techniques involved in creating isometric perspective games. The download includes the full source for the game. Feel free to play around with it and let me know if you create anything interesting with it.